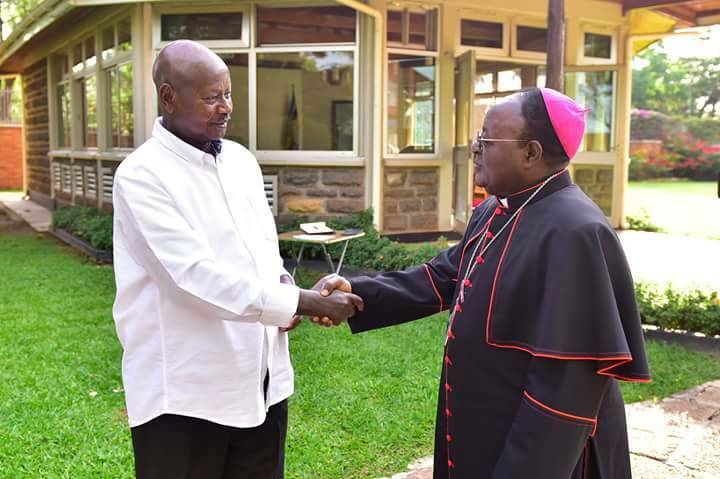 President Museveni receives Archbishop Cyprian Kizito Lwanga at State House Nakasero where the two met over the Prelate’s security concerns. Kampala Archbishop Cyprian Kizito Lwanga has reshuffled all staff around him in a bid to stave off any potential State spies as the top leadership of the Catholic Church prepares to meet over the growing conflict between some of the church leaders and the State, PML Daily has learnt. Archbishop Lwanga’s move follows his Good Friday remarks when he accused State operatives of spying on him and then misadvising the President that he is planning to overthrow the government. And now, highly placed sources in the Catholic Church in Uganda have told this website that the prelate has since moved some of the priests around him and other workers in his residence at Rubaga Cathedral in a bid to completely eliminate any chances of spying on him. Sources said the security measure was stepped up after he continued receiving threats from anonymous callers, purportedly warning him of his continued attacks against the government. Speaking at the opening of a two-day retreat of the Interreligious Council of Uganda (IRCU) in Entebbe on April 4, Archbishop Lwanga confirmed these fears, saying since Good Friday, anonymous callers have been warning him that should he not back off his criticisms against government, he will be killed like Achbishop Janan Luwum, who was assassinated by the Idi Amin regime. “I got an anonymous call; nothing showed on the screen of my phone. The caller told me that some of your religious leaders of all faiths, both Christians and Muslims, are working for the government and have been recruited. So I told him I was not aware. Then he told me, ‘Be careful, you might be the next Janan Luwum’. And I told him if God is calling me that way, fine,” he said. “So, the following day when the guards came and gave it to me, I opened it and found a list of all those who have been recruited to work for ISO, ESO, CMI and others organs and these included Catholic priests, Anglican priests and Sheikhs,” he added. He added that while preparing for Easter Sunday mass, his security detail noticed a blank tinted car without number plates parked near his gate, which sped off as his security detail approached it. “They thought I was going to walk through my gate to go to the cathedral but it didn’t happen, so when the security went near to access who it was, he turned round and rushed only to realize there were no number plates. So what had he come to do? Probably to crash the Archbishop,” Archbishop Lwanga said. However, the prelate said he does not fear such threats and scoffed at those who think these will intimidate him to stop criticizing the wrongs in government. “Security comes from God; why are big people being shot yet they have security? So, in my humble opinion, security is assured from God and then of course government should ensure security not only of leaders but also everybody. It is very sad how many people are being killed in cold blood,” he said. 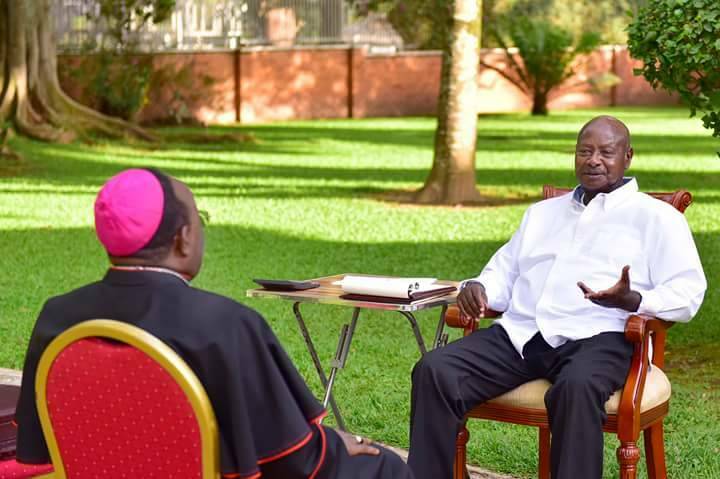 Whereas the archbishop has since met President Museveni in a bid to diffuse the tensions, sources said the prelate has since taken security measures after being informed that the government used one of his former priests, Fr. Jacinto Kibuuka, to spy on him. 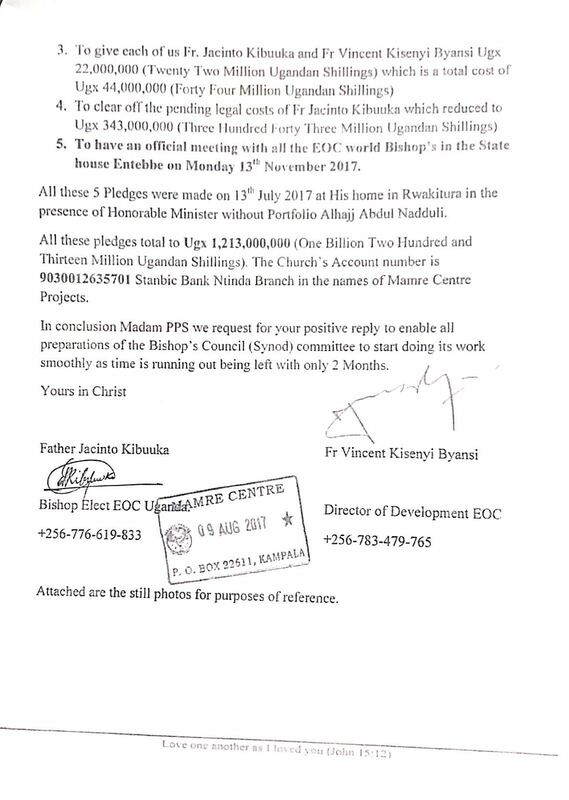 Fr Kibuuka, who was one of Archbishop Lwanga’s favorite priests later defied the latter and announced his decision to leave the church to concentrate on his Mamre Prayer Centre in Namugongo, Wakiso District. He was later consecrated as a Bishop for the Eastern Orthodox Church (EOC), which is part of the Orthodox Church and claims to be the One Holy Catholic and Apostolic Church established by Jesus. (L-R) Fr. Jacinto Kibuuka, Fr. Vincent Kisenyi Byansi, Fr. Anthony Musaala, Fr. Deogratius Ssonko at Kibuuka’s Mamre Prayer Centre sometime back. He had gone with the highly educated Rev Fr Dr Deogratius Ssonko, who has since returned to the Catholic Church, together with Rev. Fr. Anthony Musaala. 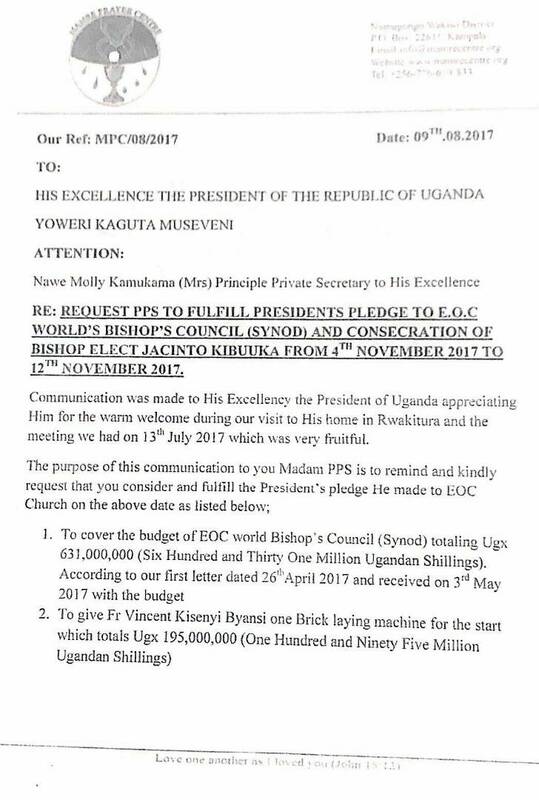 This website has seen a copy of a letter dated August 2017, purportedly from Fr Kibuuka addressed to Mr Museveni’s principal private secretary, Ms Molly Kamukama, asking that the President fulfills his pledge of Shs1.2 billion to help him sustain his Eastern Orthodox Church after leaving the Catholic Church. Meanwhile, the row has attracted the attention of the papal representative to Uganda, Archbishop Michael Blume, who is this week expected to meet with the Uganda Episcopal Conference that unites the four ecclesiastical provinces of Kampala, Tororo, Gulu and Mbarara.